The pair maintains positive tone on Wednesday and eyes psychological / option 111.00 barrier after fresh acceleration in early US trading broke above important barrier at 111.66 (55SMA). Close above here is needed to generate bullish signal for extension of recovery leg from 104.59 (3 Jan spike low) and test of 200SMA (111.27). Renewed risk appetite keeps safe-haven yen in defense and boosts the greenback. Rising bullish momentum supports the advance, but overbought stochastic warns of stronger hesitation on approach to 111.00/27 pivots. 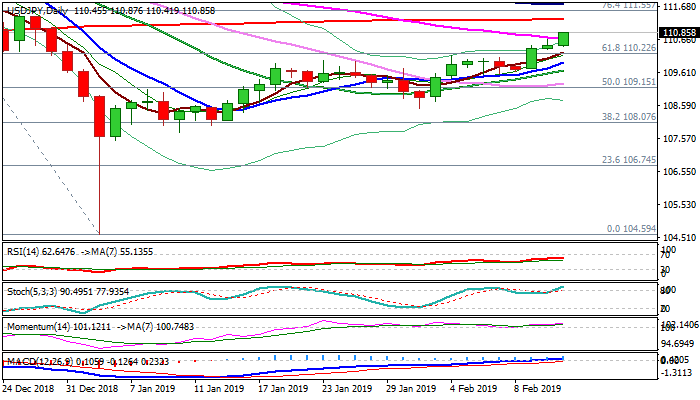 Broken Fibo 61.8% barrier (110.22) is reinforced by rising 5SMA and expected to ideally contain dips and guard pivotal 10/20SMA's (109.93/69 respectively).